As I read the first few pages of God Bless Us, Every One, I thought, This is the same book but in picture book format. Awesome. It begins in 1843, at a time when Charles Dickens is facing severe financial difficulties: his most recent work isn't selling well, his wife is expecting another baby, and the debts accumulated from helping family members are piling up. In these desperate circumstances, he has the sudden inspiration to write a short Christmas story, one that will capture the essence of the Season. As he writes, he is unprepared for how this little tale effects him personally, leading him to say, "It took hold of my heart and taught me what I did not know . . . "
That's how the book begins, but unlike The Man Who Invented Christmas, it then launches into an imaginary dream where Dickens has his own Scrooge-like experience. Most of the book stays in this place, with Father Christmas showing Dickens how even the lowliest people (adults and children alike) keep the spirit of Christmas in their hearts. I think it helps to know that the text of this book is based on The Mormon Tabernacle Choir's Christmas concert from last year. Actor John Rhy-Davies narrated (and played the part of Father Christmas), and the whole story was enacted on the Conference Center's vast stage with Dickens and Father Christmas watching everything from the air. A DVD of this portion of the concert is included with the book. I really think this story worked as part of a large-scale performance, but I'm not sure I loved it in picture book format for the simple reason that I couldn't tell who its target audience was. If it was written with adults in mind, I would have preferred far more fact and far less fiction. But if it was written for kids, then it seemed quite a bit too long. That said, I loved the illustrations--all warm and dusky and cozy. They convey the time period and the season and the holiday spirit really well. And I love the idea of introducing the story of A Christmas Carol to my children through events from Charles Dickens' own life. I haven't shown them the DVD yet, but I know that they will love seeing the story in that medium, and I think it will really help them grasp the book itself when we read it together next month as part of our Book Countdown to Christmas. 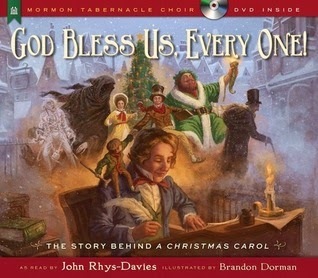 It has become a tradition for the Mormon Tabernacle Choir to turn the narrated portion of their Christmas concert into a picture book and release it the following year. I am completely on board with this tradition and hope it continues for many, many more years. It's great to see these wonderful Christmas stories (the candy bomber or "I Heard the Bells on Christmas Day," for example) retold in picture book format. Plus, I love having a copy of the actual performance so that I can relive it (if I was there) or experience it second-hand (if I wasn't). Many thanks to Shadow Mountain for a hardback copy of this book. All opinions are entirely my own.